Amaterasu also known as Ōkami Amaterasu is a fictional character from Capcom's video game Ōkami. She is a white wolf based on the actual Amaterasu in Japanese mythology. Amaterasu also appears in the Marvel vs. Capcom series. 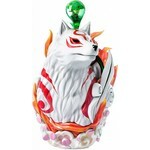 Since debuting in Ōkami, Amaterasu has garnered mostly positive reception from both video game publications and fans, often included among the top Capcom characters, best canine characters in games, and greatest video game protagonists overall.